Some of early Hollywood’s grandest homes were built not for movie stars, but real estate developers. These men were born showmen who often used their own homes to serve as advertisements for the tracts they were marketing. Two of Hollywood’s most successful developers of the 1920’s were John H. Blair and Charles F. “C.F.” DeWitt. Together they were responsible for subdividing numerous tracts throughout the region including the Wilshire Boulevard Heights Tract (1921) near Wilshire and La Brea; the Sunset Boulevard Terrace Tract (1922) @ Sunset and Micheltorena Streets in Silver Lake; Main-Moneta-Florence Avenue Square (1922); Goodyear Park (1922), the Longridge Country Club Tract and the Green Valley Lake Resort (1926) up in the San Bernardino Mountains near Big Bear. 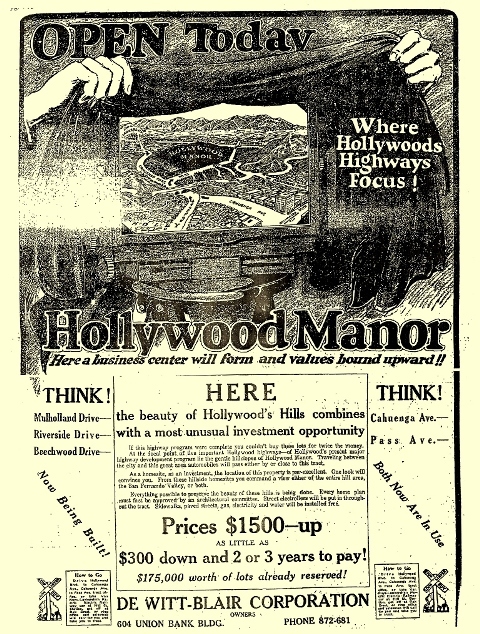 One of their most interesting tracts was the Hollywood Manor (1923), located off Barham Boulevard on the hill behind Universal Studios. DeWitt & Blair were particularly proud of this tract and lent their names to two of the main streets running through the hilly district. Today DeWitt Drive and Blair Drive remain as something of a memorial to these two prominent developers. 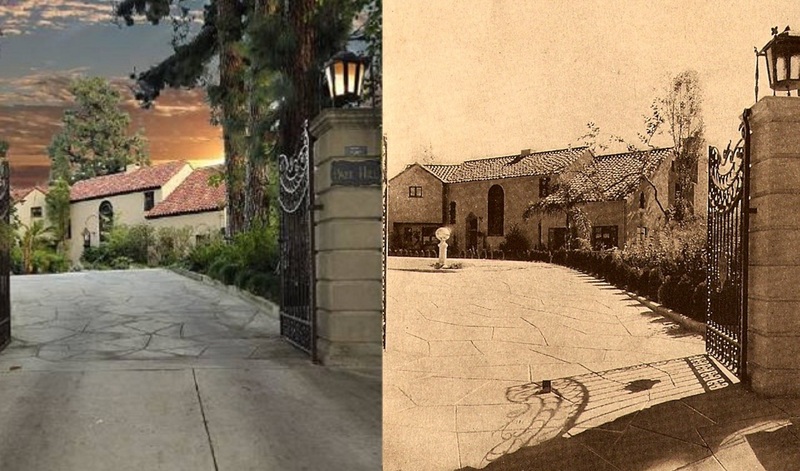 Also remaining are the two enormous mansions they built near each other in Western Hollywood in the mid 1920’s. It is interesting to note that not only do both of these mansions still exist, they continue to retain many of their original elements including large chunks of the property they were once built on, a happy irony that the homes of these two prolific subdividers have not yet been subdivided themselves. Both have come on the real estate market in the last year. Blair’s mansion, which was owned by television personality Leeza Gibbons, sold in June for $4,795,000 while the DeWitt mansion is still available @ the somewhat heftier price of $7,995,000. The John H. Blair mansion is located just off Hollywood Boulevard at 1760 Courtney Avenue. The house, which was completed in 1924, was built on a promontory against the hillside near the mouth of Nichols Canyon and cannot be seen from the road, but its impressive entry gates on Courtney offer a hint of what is above. George H. Fruehling, who designed the mansion in the form of a Mediterranean villa, was the in-house architect for DeWitt-Blair. Although his design is somewhat boxy, it is made much more interesting by the numerous terraces and balconies opening up off many of the home’s rooms. The entire ground floor was devoted to the “recreation” wing, which originally included a game room, gym and its own bowling alley. It still has a gym, but it looks the bowling alley is long gone. In more recent years, a separate guest quarters/office complex as well as a wrap-around pool was added to the estate. Somehow, and who knows how these stories get started, but somehow it has gotten into the Hollywood legend mill that the Blair house was once home to Joan Crawford. Why, Christina, why do these stories persist? A simple check of the facts will show that Joan’s residential whereabouts are easily traceable and from 1929 (the year the Blairs relocated to a new home at 3851 Avenida Del Sol in Coldwater Canyon) to 1955 Joan Crawford lived in one house and one house alone and that was her famous place at 426 North Bristol Circle in Brentwood Heights, a home which gained a new notoriety with Christina Crawford‘s book, Mommy Dearest. The nearby mansion of Blair’s partner, C.F. DeWitt, at 8159 Hollywood Boulevard, was no less impressive. in fact, in some ways it was more impressive. It’s setting alone is quite spectacular, built against the edge of a three-acre hillside lot with sweeping, headlong views across the entire Los Angeles basin. Like the Blair mansion, the DeWitt mansion was also done in the Italian style, but with a little more flair by Charles H. Kyson, an accomplished architect probably best known for the William C. Hay mansion in Los Feliz and the Tudoresque Administration complex at Forest Lawn. 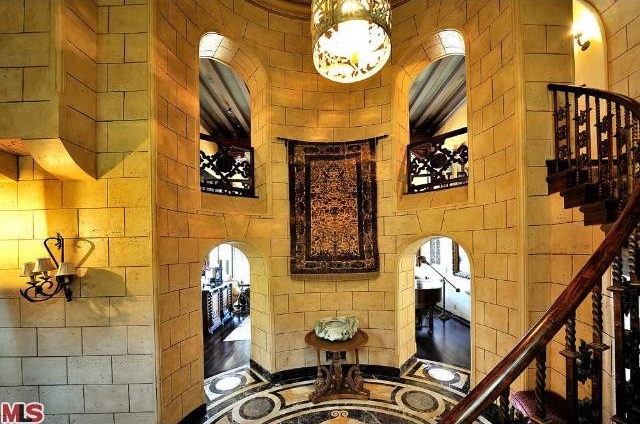 One of the most impressive features of the DeWitt mansion is its dramatic oval entry hall sheathed from floor to ceiling in cut stone and featuring a marble floor imported from Florence, Italy. A sweeping staircase leads up to a musician’s balcony overlooking the enormous 45′ x 22′ living room. Anchoring the room is an elegant 19th Century fireplace, which once warmed an Italian castle and a beautiful fountain composed of mosaic tiles commissioned specifically for the house and handmade in Italy. The principal rooms included a formal dining room, breakfast room, den, music room and billiards room. Upstairs were four master bedrooms, each with their own tiled baths, three of which featured polished crystal “fixtures” and 14 carat gold-plated hardware. The grounds of the DeWitt mansion are equally impressive, with two detached guest houses and an amazing grotto pool. When I first saw pictures of the pool, I assumed it was a more recent addition, but the grotto shows up, looking almost exactly the same as today, in photos dating to 1926. The estate’s camellia garden is world-class and is a living legacy of a later owner, Ralph S. Peer, who was president of the American Camellia Society. In 1959, one of the world’s largest camellia bushes, an enormous 30-foot high specimen, was transplanted into the garden from its original site in Pico Rivera where it had been planted in 1887 by noted water expert, Webster Cate. C.F. DeWitt owned the mansion until 1936 when he sold the home in the wake of his wife’s suicide the previous November. 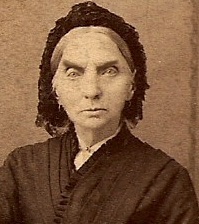 DeWitt remarried and lived to 76, dying in February of 1946. In recent years, his former home has been renamed Park Hill and, although there have been some inevitable changes in kitchen and bathrooms, the home remains remarkably as built. OK, which one would you choose if you could? Blair House has been sold, but the DeWitt Mansion is still up for grabs. See the full listing here and a great slideshow of pictures here. 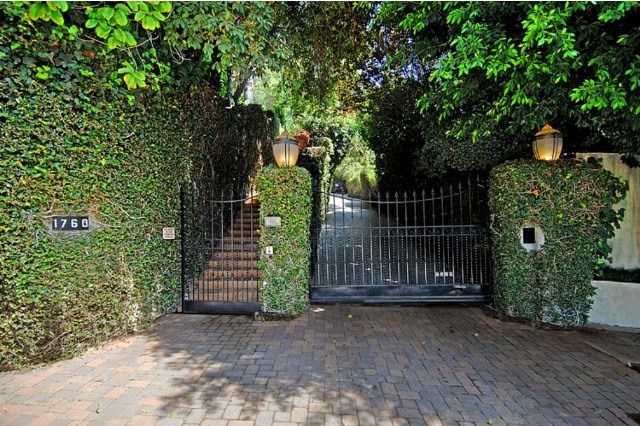 This entry was posted in Nellie Naysayer, Paradise For Sale or Lease, Then & Now, West Hollywood and tagged C.F. DeWitt, Charles H. Kyson, Christina Crawford, Coldwater Canyon, For Sale, George H. Fruehling, Joan Crawford, John H. Blair. Bookmark the permalink. DeWitt Mansion without a doubt…I love how dark and mysterious the place is and all the amount of space right in the middle of Hollywood really cannot be beat! I’d be tempted to bring back that original upstairs terrace that was enclosed; it would make a GREAT Dining Area for warm Los Angeles summer nights! Hi Jeffrey: I sent you a separate e-mail on this, but for anyone else interested – the pictures came from The Architectural Digest Volume VI No. 1 (1926). I would be interested in knowing more about George W. Fruehling. He was the architect/builder for a 1917 home in Houston, Texas, recently purchased by Hostelling International and being converted to a new HI hostel there. Can you point me to any sources? Hi: I sent you a reply by e-mail, but, at this point, there isn’t a great deal online about him. I am still trying to dig up more information on his L.A. works and I know there is another gentlemen working on his Houston years. I sent you info on that and hope that helps. Please let me know if you dig up anything and I’ll be sure to do so too. Thanks for writing! George H. Fruhling was my grand uncle. My father, George Albert Fruhling, is named after George H. Fruhling. I have some basic information about George H., but I know precious little about his overall life or career. If anyone has any information, please contact me directly. Thanks. The original architectural drawings by George Fruehling for 501 Lovett Blvd., Houston, TX 77006, a 1917-18 home for the then-mayor of Houston have recently been located, and are framed and at the house, which is now Hostelling International-Houston. Photos at hiusa.org/houston. I can provide much more detail about the house itself. My only information about George Fruehling is from ancestry.com which shows birth about 1879, spouse Blanche G., and a 1930 census residence in Los Angeles. I believe I located him in some old City of Houston street directories. Thank you for the wonderful history on the DeWitt mansion. I had the great fortune of working in that house when I worked for Ralph Peer’s publishing company, peermusic (run then by the original Ralph Peer’s son). I loved that mansion SO much, and learning more than I already knew about its history has enriched my memories–as well as making me feel that much more lucky to have had such a fabulous life experience. My Grandmother, the well known pioneer of Deep Chemical Face Peeling, Cora Galenti, owned the Blair Mansion from 1956-1961. There she established her Facial Rejuvenation clinic on the top floor while residing on the lower levels. Casey LaLonde, (Joan Crawford’s grandson) said she owned at house in the 20’s at 1760 Courtney Ave. He mentioned that Leeza Gibbons own the house now! Unfortunately, the home’s ownership records don’t reflect that. It was owned by the Blairs during all of that time and Joan was over in Beverly Hills before moving to Brentwood in 1929. He’s right about Leeza Gibbons though. Although its not her current home, she did live there for some time. Did Cora Galenti own this home at one point? Thanks for the catch, Bart! Shows I can never rely on my memory. I corrected the text so it now reads North. Thanks again!